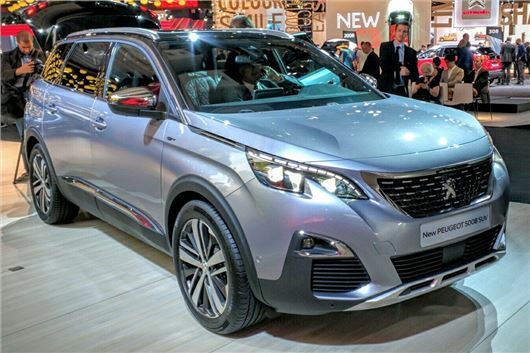 Peugeot has unveiled its all-new 5008 at the Paris Motor Show 2016. The seven-seater gets a new SUV-look, a larger platform, with more interior space, and a new range of efficient engines. Expect prices for the new 5008 to start from £24,000 when it reaches showrooms in March 2017. Longer and wider than the outgoing MPV version, the new 5008 will provide more head and legroom across all three rows. The second row of seats will be fully adjustable, while the third row can be folded away to provide more than 1000 litres of boot space. Despite its new SUV shape, the 5008 remains the same height as before (1.64m), although it will be 11cm longer than the outgoing model. The exterior styling mirrors that of the new 3008, with an upright SUV stance with muscular wheelarches. The front is dominated by a huge chrome grille, flanked by large air intakes and sweptback headlights. The flattened rear will feature LED ‘claw effect’ rear lights and wraparound bumper. Inside, the cabin gets Peugeot's futuristic i-Cockpit system, with a 12.3-inch display replacing the traditional instrument cluster. The system allows the driver to customise the layout to include maps, media and in-car readouts in a similar way to the Audi virtual cockpit system. Peugeot hasn't indicated if i-Cockpit will be standard across the range or a paid for option, though. When is this car going on sale?